Call 800-298-8924 to order Draw-Tite gooseneck part number 9460-49 or order online at etrailer.com. Free expert support on all Draw-Tite products. Guaranteed Lowest Price and Fastest Shipping for Hide-A-Goose Underbed Gooseneck Trailer Hitch with Installation Kit. Gooseneck reviews from real customers. 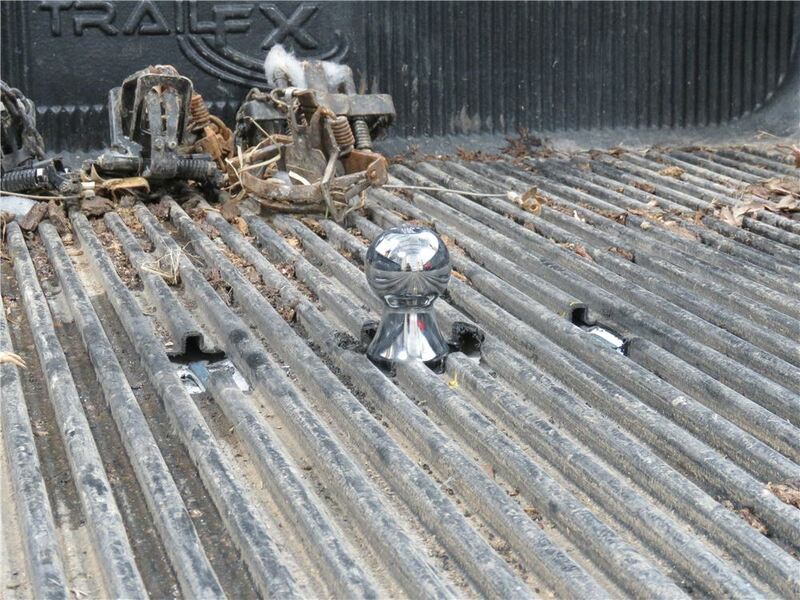 Even with the ball installed, the hitch takes up very little space in the truck bed. 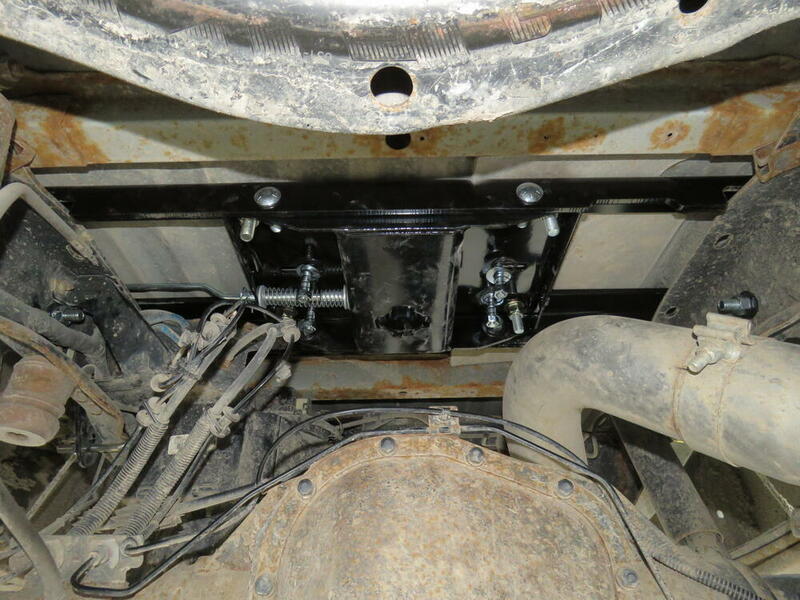 The rail system and gooseneck head unit is mounted under the bed. Only a 3-1/2" hole is required for the ball hole opening. 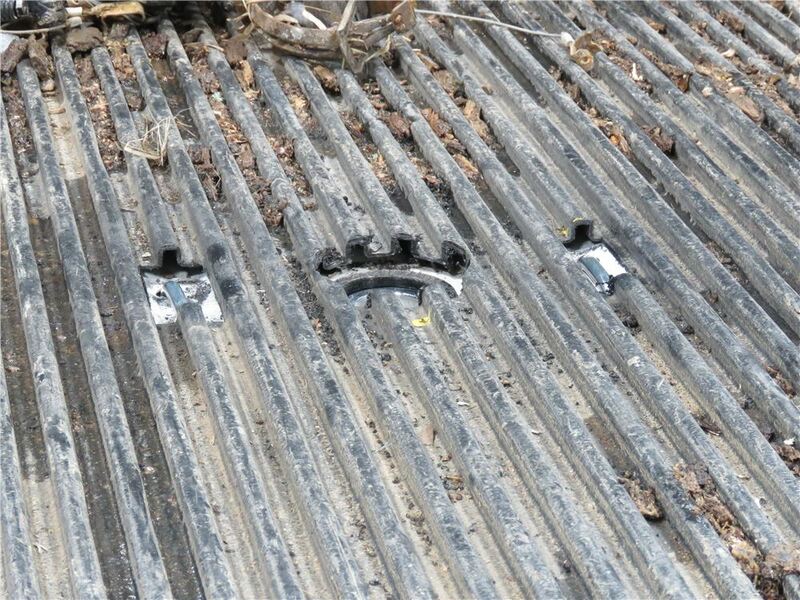 Safety chain holders sit flush against truck bed floor. When not in use, the ball can be flipped over and inserted back into the hole. The low profile design makes for uninhibited truck bed access when your carrying other gear. 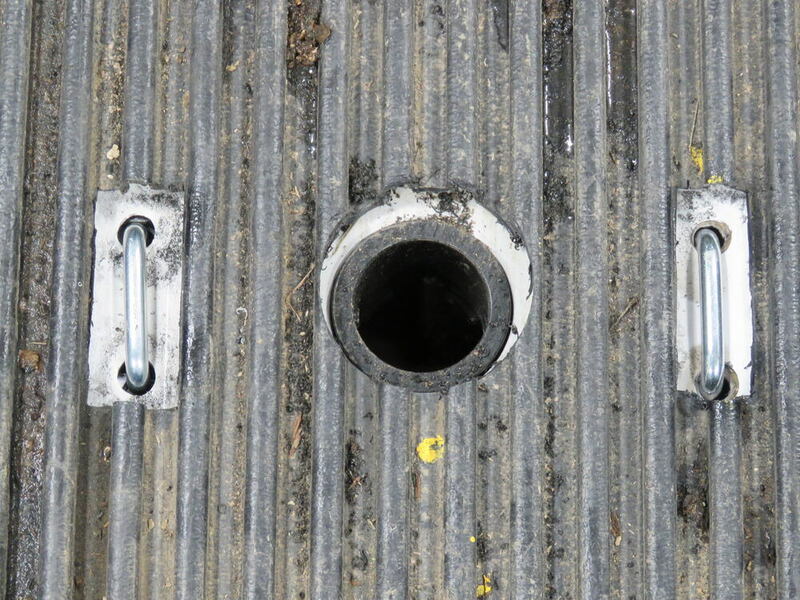 The ball hole can then be covered with the included magnet to help keep dirt and debris out. The heavy duty handle with reinforced locking pin holds the ball in place and is easily accessible in the wheel well. To store the ball, simply pull the handle and twist it to secure in the open position. Then remove the ball, flip it over and slide it upside down back into the hole. 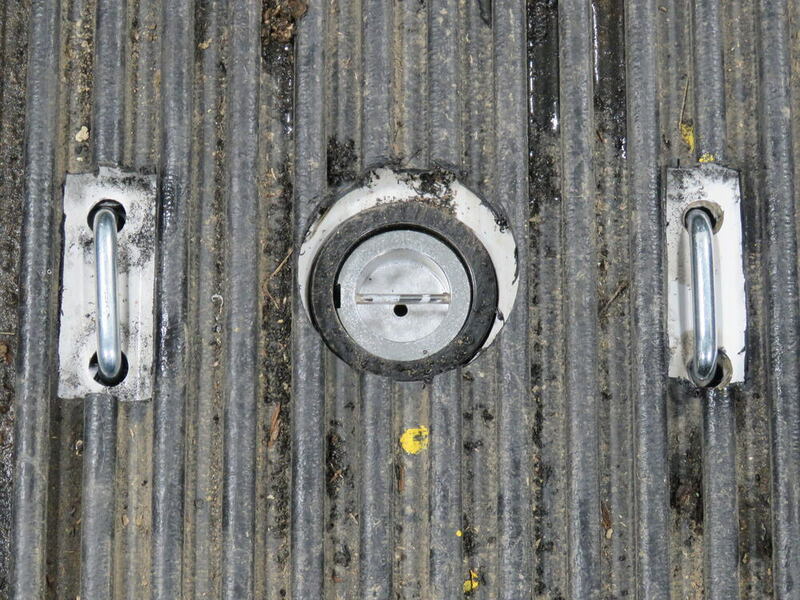 After placing the magnetic cover, simply rotate the handle in the wheel well back to its starting position and the stowed ball will be secure. 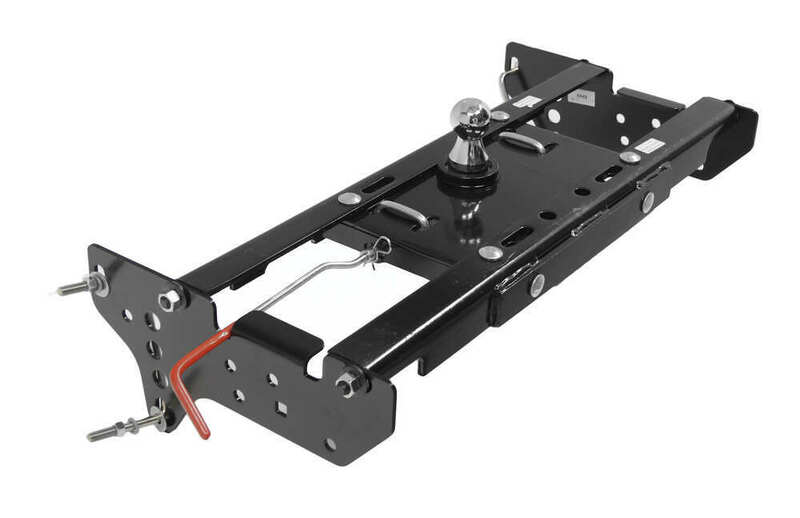 Today we're going to take a look at the Reese Hide-A-Goose underbed goose neck trailer hitch with installation kit, number 9460-49. 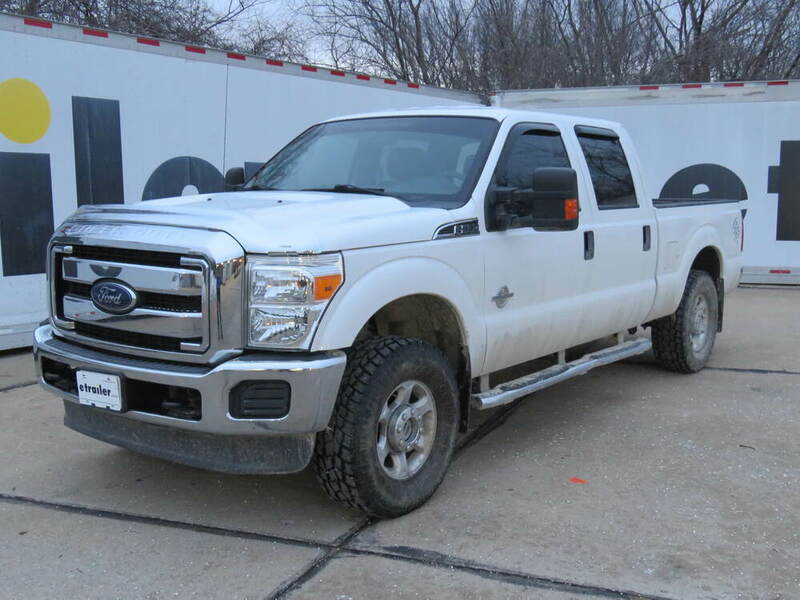 This product is for a Ford F-450 Super Duty with the eight-foot bed. It will not fit the cab and chassis models and it provides a hitch so you can tow a goose neck trailer. 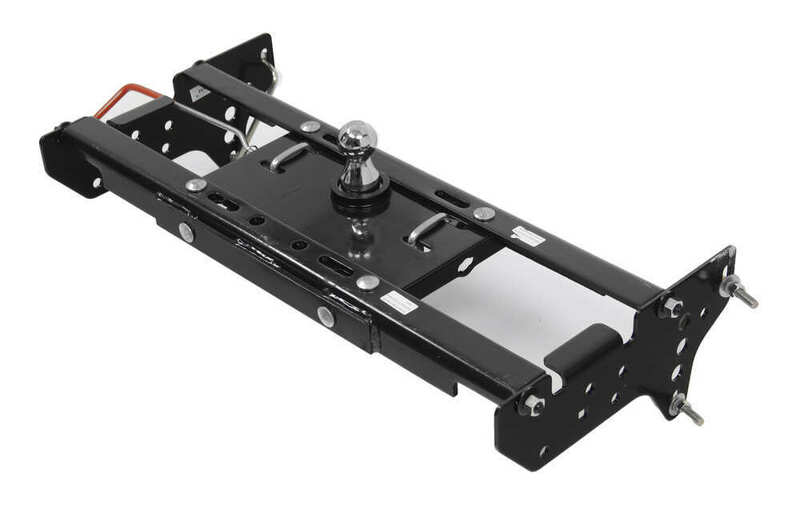 The head unit and the vehicle-specific rail kits will fit under the truck bed and the side mounting brackets here will attach to the vehicle's frame. 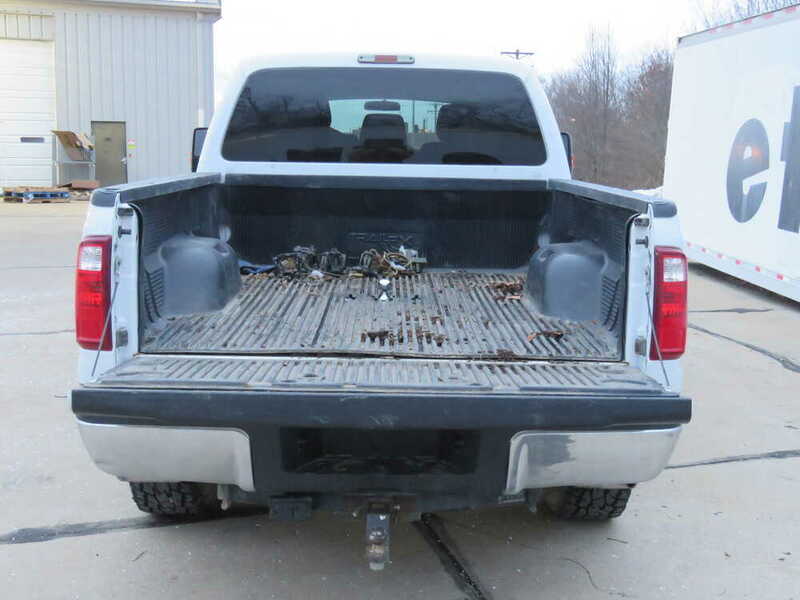 Only the ball right here and the spring-loaded safety hoops will be visible in the truck bed. The rails and hardware are all mounted under the bed, all of this right here, and it allows for full truck bed access when the ball is stored. It includes a 2-5/16 of an inch that can be stored upside down in the bed when not in use, and I'll show you how to do that in just a moment. The ball has a round shank, which reduces rattle in the hitch, and the round sleeve and ball have a tighter fit than the square designs. We'll go ahead and show you how to use that now. You grab your handle here, which would be accessible through the fender well. It provides convenient fender well access for the handle to disconnect the trailer hitch ball and the durable handle is very easy to grip. Just pull that out and then lift up a little and it'll catch right here on the side. You will pull the shank out and you can see there's a groove here and a notch on the inside, and right here is a ball or a bar so you can use that to lower that down. When it's not in use, you can place this magnet over the top to prevent any kind of dirt, grime, that sort of thing from getting inside of the sleeve. Then you would just turn that and that's in there solid. Same thing when you want to take it out, just lift it up with the bar, line up the groove here with the notch in here, close that, and you're locked and ready to go. 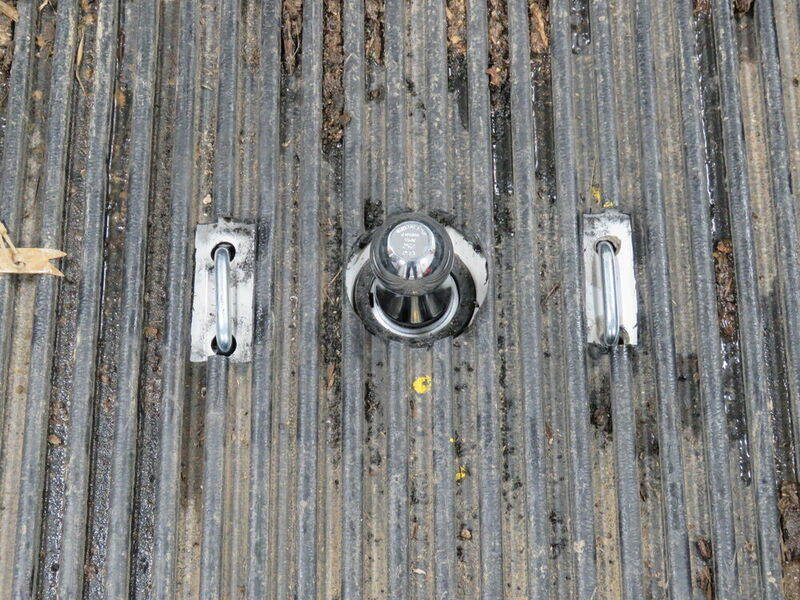 It includes safety chain attachment points that will sit flush in the truck bed, these right here and these are, again, these are spring-loaded. 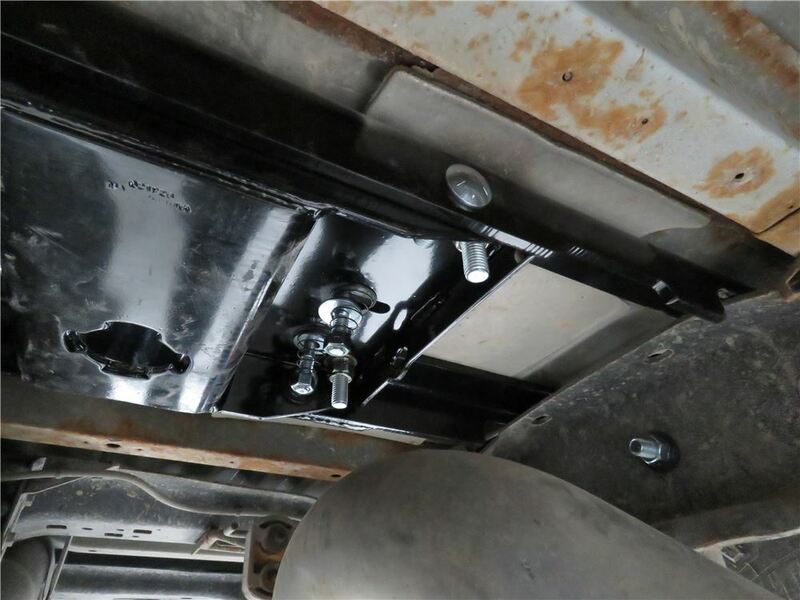 The vehicle-specific rail kits install very quickly very no drilling, welding, or bed removal required. It installs to the head unit with eight 5/8 inch diameter grade 8 carriage bolts, and that is these right here, and there's two more back here. It has an inaudible 00:03:01 coat base with a powder coat finish for superior corrosion resistance and it does come with a limited lifetime warranty. Once again, the ball size, 2-5/16 of an inch for the towing capacity please check your vehicle owner's manual. 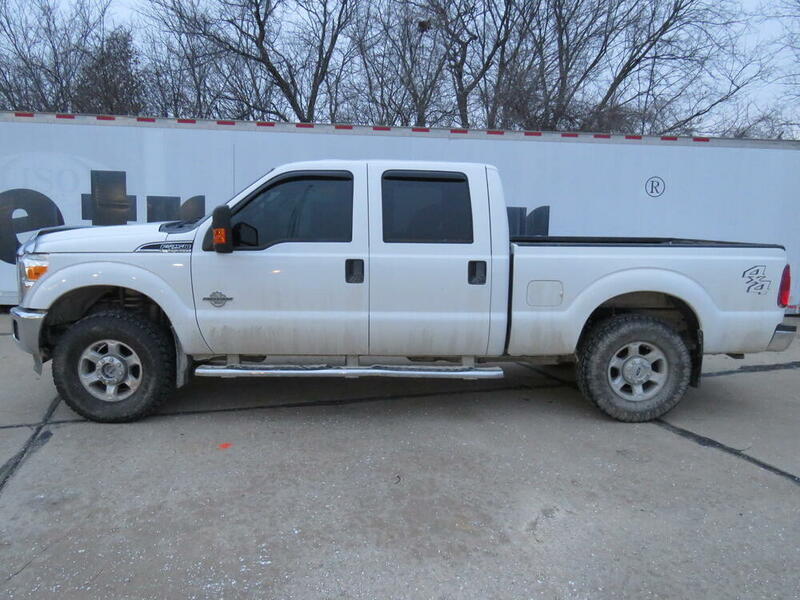 This unit is rated to match the manufacturer tow rating. The head unit is rated for 30,000 pounds of gross towing weight with a 7,500-pound vertical load limit, but if your truck has a GTW of less than that, you need to go by the smaller number to ensure safer towing experience. 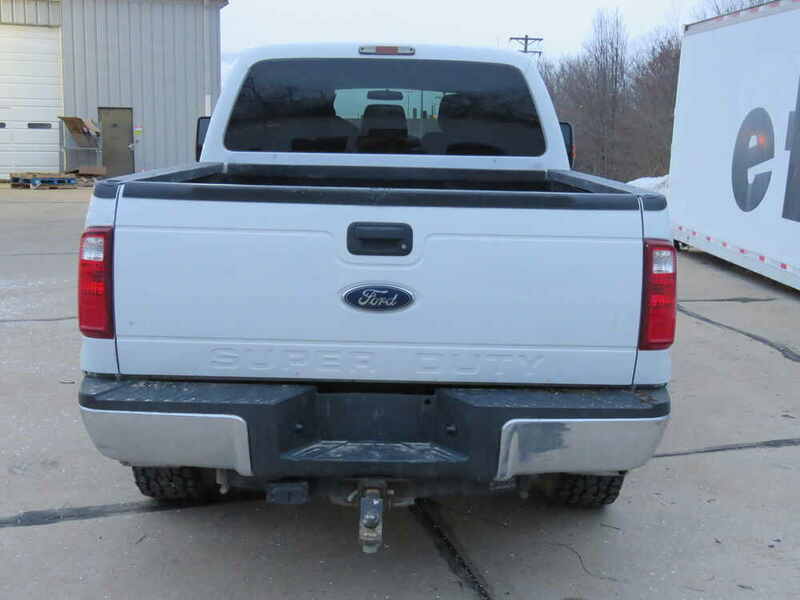 The rails are rated to match the manufacturer tow rating as well. 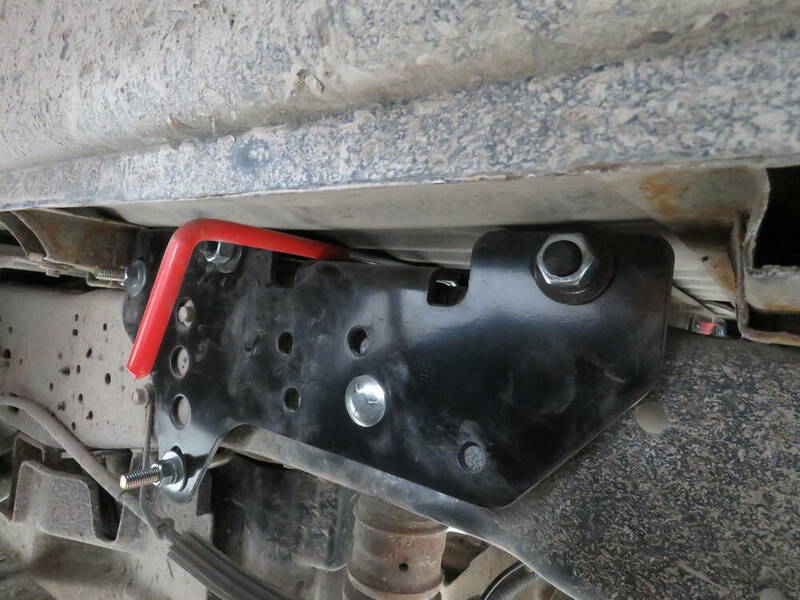 Quick installation tip, you're going to need a 3-1/2 inch hole for the hitch ball and 4-9/16 of an inch holes for the safety chain holders to ensure that this is a good fit for your truck. Finally, this is tested to vehicle equipment safety commission standards. 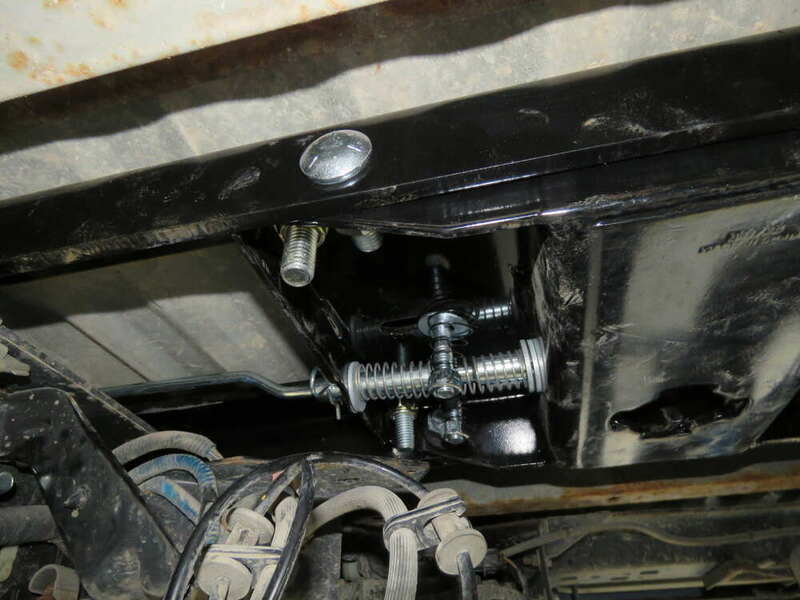 That should do it for our Reese Hide-A-Goose underbed gooseneck trailer hitch with installation kit, number 9460-49. .
What all parts are included with the hitch kit? 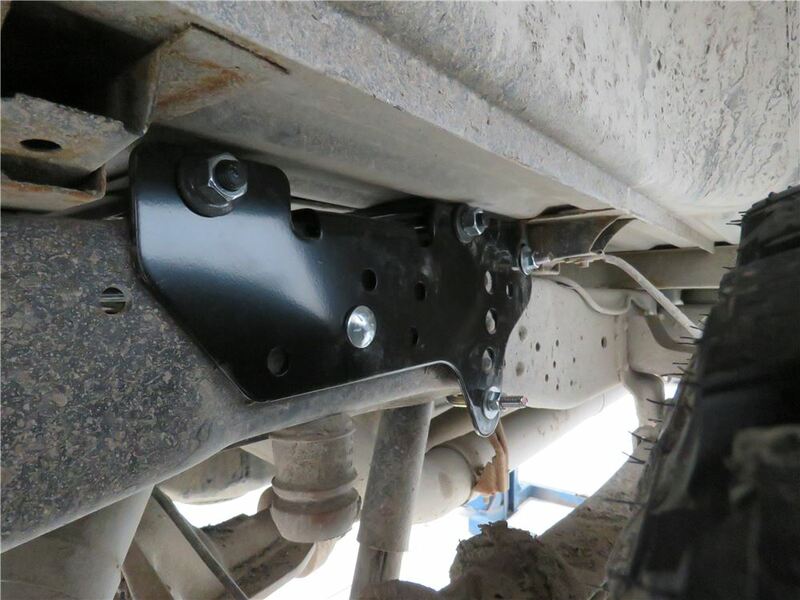 Included are the brackets that attach to the truck frame, the rails that go between the brackets, the gooseneck hitch that attaches to the rails and all the hardware. You can check the instructions link on the page for a complete parts breakdown. Hitch works great, no problems with the ball or linkages freezing up. Everything seems good. Have used it to pull a cattle trailer 12+ times this year. Still just as happy with as one could be!Thanks for the follow up. Had to remove the hitch when I had the frame replaced on my Tundra, so I had to install the hitch again! The hitch is in great shape after about 2500 miles of pulling a 6000 pound trailer. It works as advertised, was a good price, and got shipped fairly quick. If youre even slightly mechanically adept, you should have no problems with the install. Even if youre not that handy, watch videos online to figure it out! As far as the cheap magnetic cap, I found a large freeze plug and painted it black to match the bed lining! Works great! 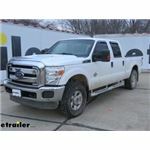 The Draw-Tite Hide-A-Goose Underbed Gooseneck Hitch # 9460-49 referenced in your question is confirmed to fit your 2002 Ford F-350 with the long bed. For your long bed truck (and the short bed models as well) the center hole will indeed be cut 46-3/16 inches from the rear of the bed and centered between the wheel wells. I have attached the complete installation instructions that you can also reference. For your 2003 Chevy Silverado 2500 HD with a Duramax the correct Hide a Goose hitch and install kit would be the part # 9465-34. This would be the correct kit regardless of your bed length. The # 9460-49 is for a Ford truck so I would not recommend it for you. I attached an install video for you to check out as well.